Atlanta is a diverse city with many different cultures, interests, and events colliding. However, one of the most rapidly rising in popularity is its art scene, especially in Downtown Atlanta, where everything from galleries to large-scale murals can be found. Whether you’re new to Atlanta or have called it home for years, here are a few of the Downtown art galleries, events, and museums you should know about. If you’re looking for culture but need to pinch pennies, Gallery 72 is a great place to check out local artists for free. This contemporary gallery features everything from paintings to installations from Atlanta-based creators. It even hosts exhibits surrounding topics like Atlanta’s music history as well as social issues like civil rights. Only a couple blocks from the Five Points train stop, the Mammal Gallery is a truly unique experience for the socially engaged. A self-proclaimed “safe space for creative minds,” the gallery has opportunities for interactive creative expression like live music and open mic nights, as well as experimental exhibits that keep guests thinking long after their visit. Prefer to explore your creative side in the fresh air? Downtown’s neighboring Castleberry Hill offers a free art stroll every second Friday of the month. With different galleries and installments on display each month, you can grab some friends and make it an evening of local art and culture, even grabbing dinner at one of the participating restaurants, such as No Mas! Hacienda and Cantina, along the way. Eyedrum is Atlanta’s one-stop shop for everything a creative mind could hope for: literary readings, avant-garde film screenings, a community garden, and extraordinary exhibits that push the boundaries of the current art scene, just to name a few! There are even opportunities to build upon your own creativity with unique classes and workshops, such as the Eyedrum Literary Committee’s editing meet-up and the gallery’s filmmaking workshops, that allow you to hone your skills and meet others who share your passion. This gallery actually has two locations--one in Atlanta and the other in France. It is home to permanent as well as temporary, special exhibits devoted to famous artists and highly skilled individuals from around the world. The European style of the building comes from its French sister and has been around since 1885. 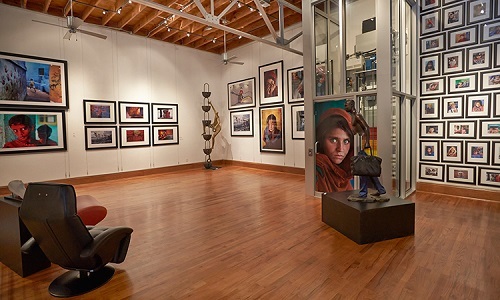 If you’re looking to experience a taste of classic European elegance and high-end art, Besharat Gallery is a must-see. To submit a guest post to the AtlantaDowntown.com blog, please contact Paige Sullivan at psullivan@atlantadowntown.com.